Rate information: The dividend rate and annual percentage yield may change every month. Please call for current rates. Dividend period: For this account type, the dividend period is monthly. For example, the beginning date of the first dividend period of the calendar year is January 1, and the ending date of such dividend period is January 31. All other dividend periods follow this same pattern of dates. The dividend declaration date follows the ending date of a dividend period, and for the example above is February 1. Minimum balance requirements: There is no minimum balance required to open this account. You must maintain a minimum average daily balance of $2,500.00 in your account to earn the higher disclosed annual percentage yield. Average daily balance computation method: Dividends are calculated by the average daily balance method which applies a daily periodic rate to the average balance in the account each day. Accrual of dividends on non cash deposits: Dividends will begin to accrue on the business day you place non cash items (for example, checks) to your account. Transaction limitations: The minimum amount you may withdraw is $250.00 per withdrawal. 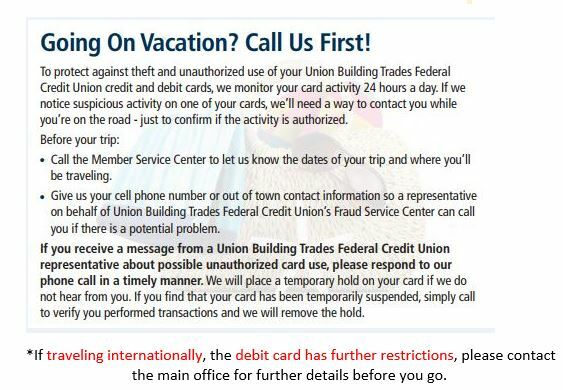 During any month, you may not make more than six withdrawals or transfers to another credit union account of yours or to a third party by means of a pre authorized or automatic transfer, or telephonic order or instruction. No more than three of the six transfers may be made by check or similar order to a third party. If you exceed the transfer limitations set forth above, your account will be assessed a fee and is subject to closure by the credit union. Tier 1: As of the last dividend declaration date, if your average daily balance was $50,000.00 or more, the dividend rate paid on the entire balance in your account was % with an annual percentage yield of _____%. Tier 2: As of the last dividend declaration date, if your average daily balance was more than $24,999.99, but less than $50,000.00, the dividend rate paid on the entire balance in your account was %, with an annual percentage yield of _____%. Tier 3: As of the last dividend declaration date, if your average daily balance was more than $9,999.99 but less than $25,000.00, the dividend rate paid on the entire balance your account was %, with an annual percentage yield of _____%. Tier 4: As of the last dividend declaration date, if your average daily balance was more than $2,499.99, but less than $10,000.00, the dividend rate paid on the entire balance in your account was % with an annual percentage yield of _____%.